multimedia on Told you I had A.D.D. Hey, saw your forum topic asking for help. These cards are all good, but they are low impact in this deck. Smoldering Marsh : lots of basic lands here. Foreboding Ruins : lots of Swamps/Mountains here. Most of these ETB untapped which is important when you want to get Kaalia onto the battlefield as quick as possible; don't want to be delayed because of your lands. Open the Armory : tutor for one of Greaves, Boots, Tempest, Animate, Dance, or Helm if you have Aurelia. Can get you possible haste, protection, reanimation or a win condition combo piece. Faithless Looting : draw and if Kaalia is stopped it's a way to get a big creature into your graveyard from your hand to then reanimate. Buried Alive : backup plan along with reanimation if Kaalia is stopped. Mother of Runes : protect Kaalia or the Demon/Angel/Dragon you cheat into play. Talisman of Indulgence : two drop mana rock. Fellwar Stone : two drop mana rock. Mind Stone : two drop mana rock. 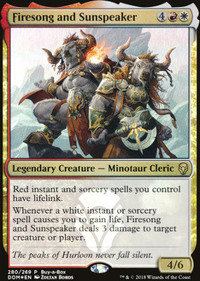 Master of Cruelties : win condition creature to cheat into play with Kaalia. If you cheat him his attack alone clause doesn't matter. He comes into play tapped and attacking; you already passed the declare attackers combat step and that's where the attack alone clause matters. 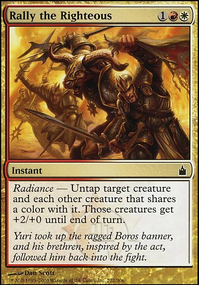 Kaalia and him attacking together has the potential to kill an opponent from out of nowhere. Steel Hellkite : can completely wreck your opponents one at a time. Consider cutting the higher mana cost mana rocks for two or less CMC options? Kaalia is a four drop which makes her a prime creature for early game ramp. Being able to play her turn two or three is good. It's great to have an opening hand of Sol Ring and a two drop mana rock, adding more of them gives you more chances. Kiki isn't worth the combo potential because there's too many legendary creatures here. Bombardent and Tremors are too low impact cards, only good with Kiki is not worth playing. You should add Hall of the Bandit Lord , any deck that has any aspect of voltron in it benefits from that land. 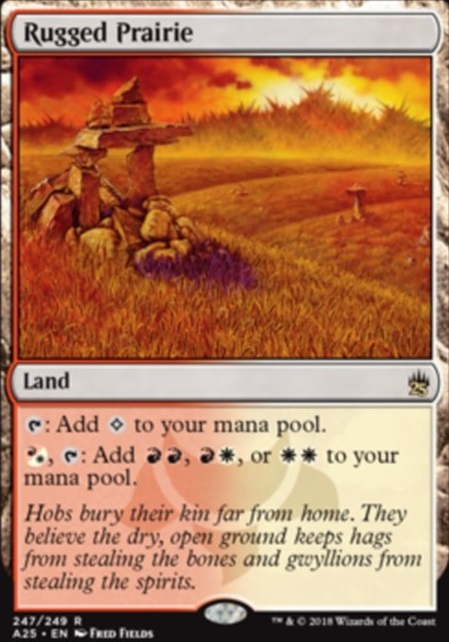 BTW I'm not sure if it would present any benefits to the deck, but the hybrid color filter lands are always something to consider: Fetid Heath , Cascade Bluffs , and Rugged Prairie . 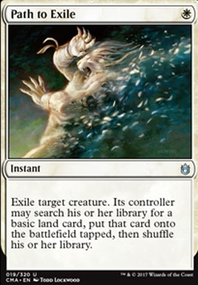 Since the only white card in the mainbord requiring white mana is Rally the Ancestors it could be an option to replace the lands generating single white mana by a combination of Fetid Heath and Rugged Prairie. A few thoughts that you may want to consider. Some will have to be weighed against budget but I think they all bring the deck a little more of an edge. 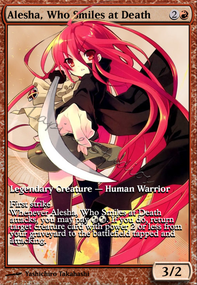 Alesha, Who Smiles at Death has to be a fast deck to be effective as she will quickly get burned out if things move too slowly for you. Faster dual lands that don't come into play tapped give you an edge early game that is not to be underestimated. They are a little pricey but if you can grab them they will certainly up the pace. 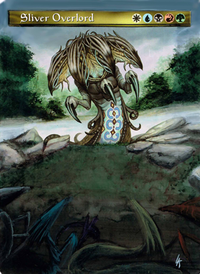 The pain lands Sulfurous Springs, Karplusan Forest, Caves of Koilos The filter lands Graven Cairns, Rugged Prairie, Fetid Heath The check lands Dragonskull Summit, Isolated Chapel, Clifftop Retreat Also Talisman of Indulgence is an pretty damn good budget mana rock in your colours. Just a couple more card draw options Read the Bones and Painful Truths are both better than Cathartic Reunion in my opinion. 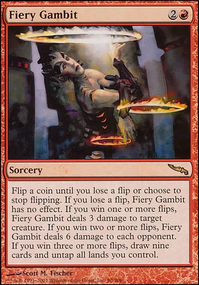 Usually I wouldn't advocate for higher cost cards but Mardu suffers from card advantage and I think its worth it not to lose those two cards....or have to, at the very least, worry about recurring them. Neheb, the Eternal is for the infinite combats Aurelia, the Warleader in conjunction with Aggravated Assault. After you deal 6 damage due to Aurelia's double combat phase, you can go into infinite combats and infinite red mana. Read Ward of Bones, you are denying them of resources. 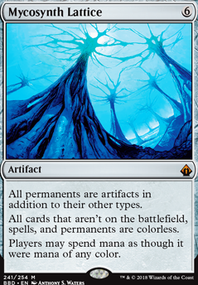 For , that is easily accessible in colorless mana or burst rituals, a T1 or T2 Ward of Bones stops people cold. For land base, you should keep it to 32 or 33. All 7 fetches, Dual Land, Shockland, Command Tower, Reflecting Pool, Mana Confluence, City of Brass, Exotic Orchard, Battlefield Forge, Cavern of Souls, Rugged Prairie, Ancient Tomb, Gemstone Caverns, Clifftop Retreat, Strip Mine, Buried Ruin, Command Beacon, Flagstones of Trokair. Emeria can be cut.